"The Go Pet Club Cat Tree is a whopping 62” tall, allowing your cat to climb, explore, lounge and scratch to his heart’s content." "This affordable and long-lasting option will surely be enough to entice your cats." "Made with premium pressed cardboard that is durable against even the most aggressive scratchers." "A great choice for anyone who wants to easily stash away their cat post when guests come over." "This scratcher features a curved design that comfortably cradles your cat. " "Not only will this scratch post teach your kitten early on that scratching your furniture is not okay, but it will also keep him entertained." "This triple platform tree features seven scratching posts wrapped in jute, and measures 17.7” x 17.7” x 45.9”." "Owners say the Sofa-Scratcher is a literal sofa-saver." Is your cat the type to hide out in cabinets or high shelves? The Go Pet Club Cat Tree is a whopping 62” tall, allowing your cat to climb, explore, lounge and scratch to his heart’s content. It’s both a cat condo and a scratching post, which can be enticing for felines who have otherwise shunned standard posts. The base of the tree is 26” x 19” and it offers numerous perches and hammocks for your kitty to hang out in. The tree is covered in faux fur but features eight different scratching posts wrapped in natural sisal rope to entice your cat all throughout the tree. The Go Pet Club Tree does require a little bit of construction, but once it’s completed, you’ll have a cat post your felines (and your couch) will appreciate. Many cat posts are made from cardboard, but the Pioneer Pet SmartCat Scratching Post is covered in durable sisal which entices scratching. The post itself is 32” tall and features a wide 16” x16” base to prevent wobbling during use. The base is made from wood, so it’s durable and blends in well with home decor. The post easily attaches to the base with two screws and minimal assembly. All in all, this affordable and long-lasting option will surely be enough to entice your cats. Though you should expect to replace your cat post as it wears down, a good product will last for a reasonably long time. The 4CLAWS Wall Mounted Scratching Post is made with premium pressed cardboard that is durable against even the most aggressive scratchers. It also mounts to a wall or door via stainless steel hooks, so it won’t fall over when your cat is scratching. The post is 26" x 5.7" x 1.6" thick, allowing enough room for even a large cat to stretch and scratch. Because the 4CLAWS post is a single piece of cardboard, you will have to replace the whole post once the corrugated part wears down, but reviewers say it lasts much longer than competitor products (one cat used it for a full five years!). Owners say the mount is sturdy and secure, and cats love it. Short on space, or need a post you can easily travel with? The Trixie Pet Products Miguel Fold and Store Cat Tower is a great choice for anyone who wants to easily stash away their cat post when guests come over. It also features a plush condo and hammock as well as hanging toys to keep your cat entertained. The 16” x 10” natural sisal scratching surface is durable and slanted for easy access. The entire piece is 20.25” x 13.75” x 25.5”, and comes in brown or light gray. Plus, when not in use, this tower folds and can be tucked away in a closet. The PetFusion Ultimate Cat Scratcher Lounge is a scratching post your cat will never want to leave. Made from recycled cardboard, this scratcher features a curved design that comfortably cradles your cat. And if the lounge-ready design alone doesn’t attract your cat, it’s also infused with organic catnip leaf. It measures 34” x 10.5” x 10.5” and is reversible, so when one side wears down, there’s another fresh scratcher ready to go. It also comes with a 6-month warranty if you’re unhappy for any reason. The PetFusion Ultimate Cat Scratcher will surely becomes a cat’s favorite hangout spot — it’s wide enough to fit two cats, and strong enough to withstand even the most aggressive scratcher. It’s a good idea to get kittens acquainted with a scratching post early on, and the Catit Play 'n Scratch Cat Toy is a fun way to get him interested. This toy-meets-scratcher is 14” in diameter and comes in green, orange and purple. The corrugated cardboard scratch pad can even be replaced when it wears down. The plastic ring also features a tracking ball and spring-mounted pom-pom toy to keep your cat entertained and attracted to the post. Not only will this scratch post teach your kitten early on that scratching your furniture is not okay, but it will also keep him entertained and give him some much-needed stimulation. Reviewers say their cats are obsessed with the Catit Play 'n Scratch Cat Toy. Though it’s made from lightweight plastic, it holds up well use after use, especially for kittens. It’s also a great choice for working cat parents, as it provides endless entertainment when you’re away. If you have more than one cat roommate, you’re probably used to replacing cat posts over and over again. Cats scratch for many reasons, but one is to mark their territory—so a multiple-cat household may find their cats scratching more often. The AmazonBasics Cat Activity Tree with Scratching Posts is an affordable way to keep all of your felines happy and content. This triple platform tree features seven scratching posts wrapped in jute, and measures 17.7” x 17.7” x 45.9”. The square base seamlessly fits in room corners and is extremely sturdy, even with multiple cats jumping on and off. This cat tree does require assembly, but customers say it’s simple to put together. If you are looking for an affordable scratching post for multiples, this one from AmazonBasics may fit the bill. Though you never want to encourage your cat to scratch your couch, if he’s been doing it for years it may be a hard battle to win. Sometimes, even with the best scratching post money can buy, your cat will still be attracted to your couch—and that’s where the 'Sofa-Scratcher' Cat Scratching Post comes in. This couch corner post comes in eight colors that blend in with your couch and is made to protect the most vulnerable parts of the upholstery. It measures 24” x 10” x 10” and is covered in woven sisal fabric. It weighs seven pounds, so it’s hefty enough to withstand your cat’s scratching. Owners say the Sofa-Scratcher is a literal sofa-saver, remarking that once their cats went after their sofa corners, there was no stopping them—until this post came along. You can even match the color to your sofa, so it’s barely noticeable and won’t detract from your decor. We bought a top-rated cat scratching post and our reviewers tested it for 120 hours. 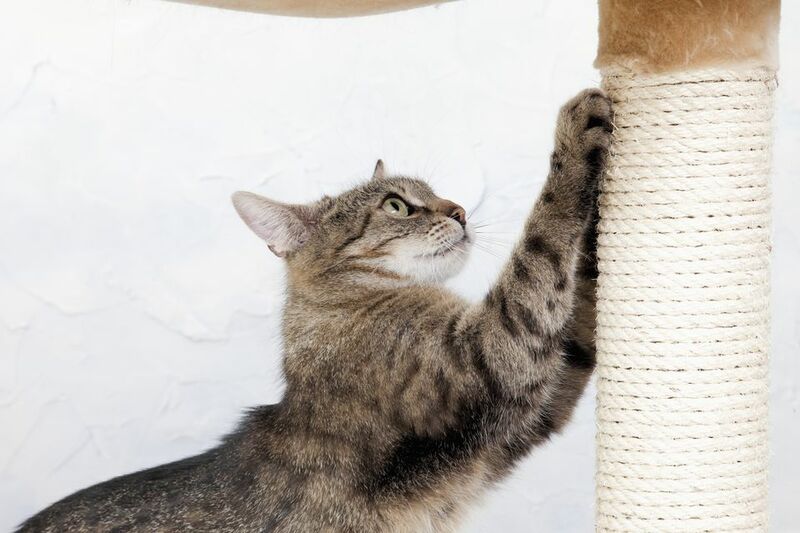 We asked our testers to consider the most important features when using this scratching post, from its size to its style. We’ve outlined the key points here so that you, too, know what to look for when shopping. Size Cat scratching posts come in many shapes and sizes. The perfect build for you will depend on your space constraints as well as the size of your feline friend. If you have more than one cat, you may want a bigger one (with more options for scratching and playing), but if space is tight, there are smaller models that may be a good fit. Features While some cat scratching posts offer just that, some are equipped with much more, like places to lounge and climb or attached toys for entertainment. Consider your cat’s personality and the size of the post to determine if you want a basic version, a maxed-out model, or something in between. Style Since the cat scratching post will be part of your home, you want it to match your style — or, at the very least, you don’t want it to stand out in a garish way. Scratching posts come in a wide variety of styles, though, so with a little searching, you’re sure to find one that fits both you and your cat. “This product is worth buying as long as you have the space for it since it’s a pretty large cat tree,” explained one of our testers. “There are plenty of posts for a cat to scratch, and there are so many spots for them to lounge or play on.” One reviewer also liked its height: “It's tall, so my cat can climb up to any tier she wants to be on,” he noted. On the other hand, our testers thought that its off-white color and non-removable fabric pieces made it both more susceptible to dirt and harder to clean.